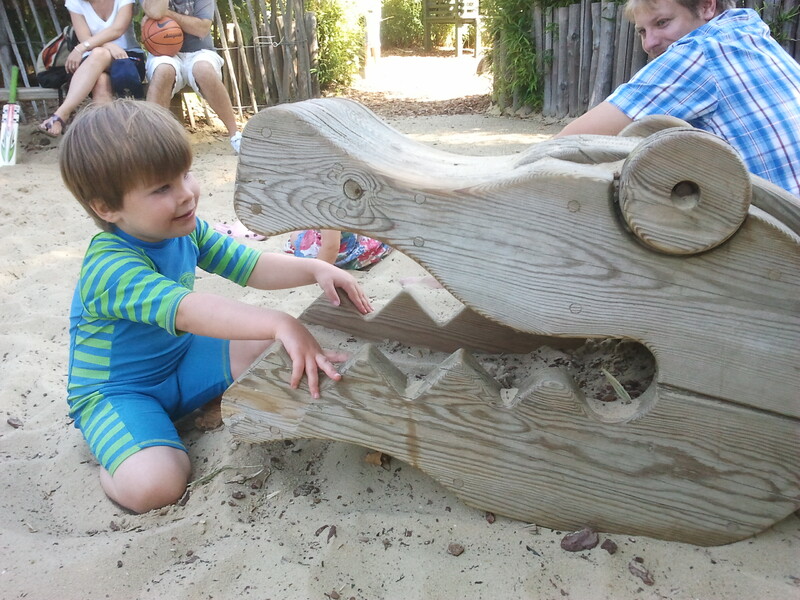 The Diana Memorial Playground was like my Everest. My great white whale. Every time I mentioned that I write a blog on London for Toddlers (cause it comes up ALL the time in real life…), someone would say “Ooh, so you must have been to the Diana Memorial Playground?”. And I would be forced to admit that I hadn’t, and for no better reason than it was a bit awkward to get to. And over time, I had developed a bit of a mental block over it. My Everest, you see. I tried explaining this to Nathan and he was confused. 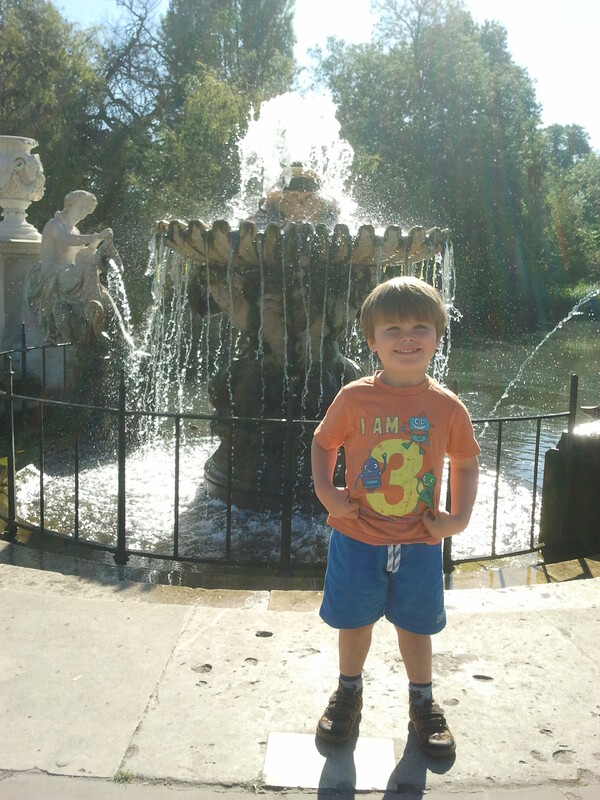 He thought I meant the Diana Memorial Fountain, which we visited in May. “Why would that be an Everest?” he pondered. Nathan, it wouldn’t be. This is something else. Now, go and put the dishwasher on. None of us knew quite what it was but it looked exciting! 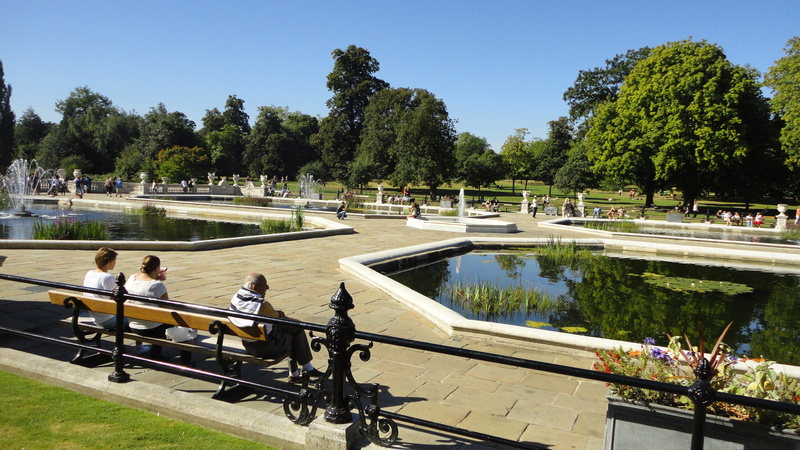 Turned out to be the Italian Gardens – a beautiful and entirely un-toddler-proofed set of ponds, leading onto the Long Water. Roo spent a happy few minutes running around (not near the edge of the ponds, don’t worry) and posing for photos for his Daddy. See, perfectly safe! While “researching” this piece (i.e. trying to remember what the heck that first playground was called), I came across this gem on youtube, It’s basically an American slagging off British safety standards, based on one of the playgrounds in Hyde Park. Made me feel a little odd, writing about my 3-year-old running loose round some open water, hence all the disclaimers in the last paragraph. Lucky that FlawlessBoy is so sensible when it comes to danger. Hold up, I’m getting confused. Anyway, let’s move on…without whispering the words litigation culture. 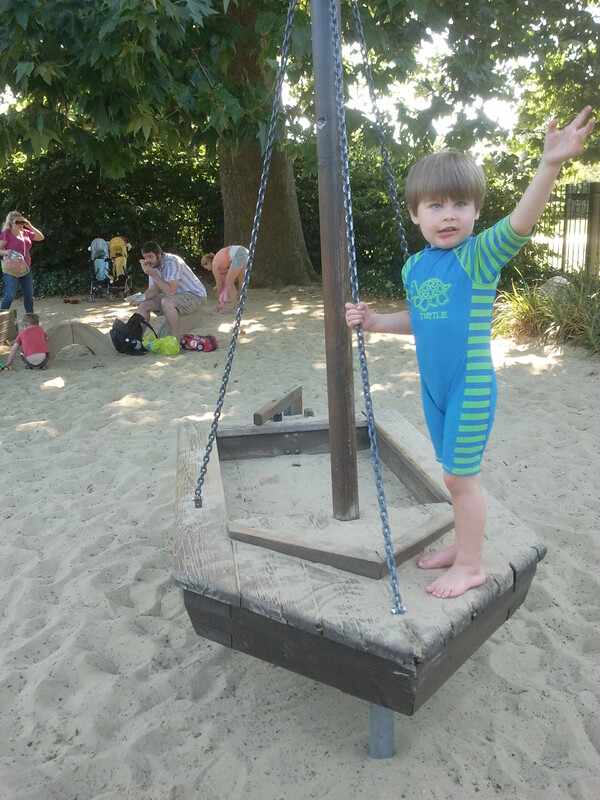 Turns out that the Diana Memorial Playground is not near Lancaster Gate tube. It’s nearer Queensway. We had another 15-min walk or so before we got there. Ah well, it was nice to see the Italian Gardens, anyway. Finally, we got there and I was relieved to be able to walk straight in. I had heard tales of long waits and one-in-one-out policies. But no, we arrived at 11 and were fine. By the time we left, at 13:30 it was a different matter. Get there early! We parked the buggy with a load of other buggies in the shade, and Roo jumped out and headed straight for the pirate ship. I had heard a lot about this ship and it truly was a thing of wonder. Nets, rope bridges and ladders to get into and then you could climb down into the lower deck and play in the sand inside it. 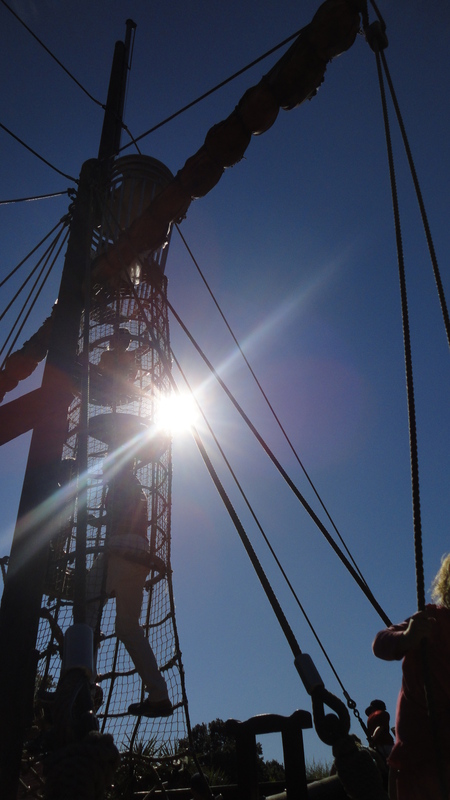 Or climb the rigging, abseil down the ropes or jump off the side. It was pretty awesome. I had to start to admit that this might just be London’s best playground. 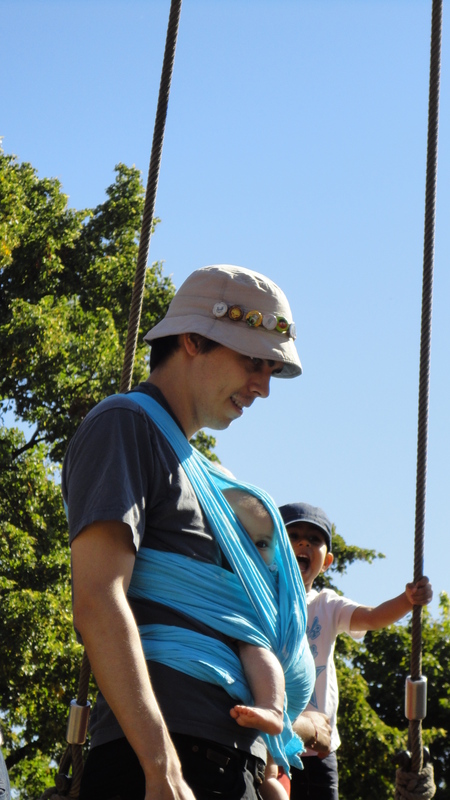 Not just for toddlers either – plenty of school-age kids were having a great time too. 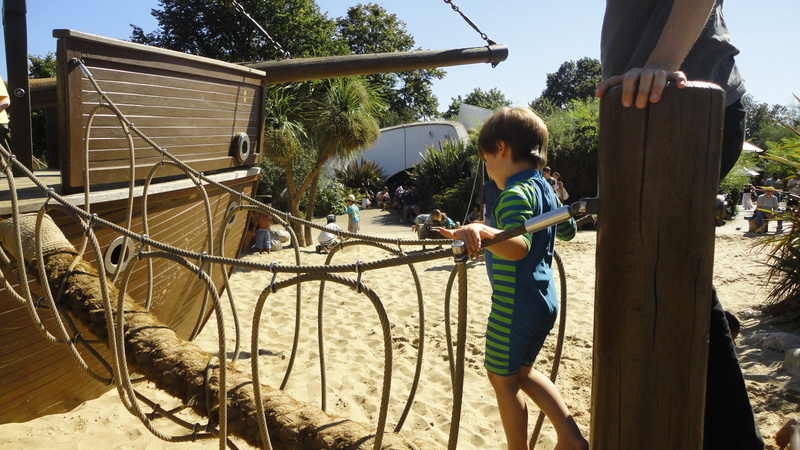 The whole playground had a Peter Pan theme to it, as does the rest of Kensington Gardens, and this lent itself nicely to boats in the sand, crocodiles and wigwams as well as an elevated walkway/slide. Even the drain covers were fashioned to look like treasure chests (much to the frustration of Roo, who tried to open them). When it came to lunch, there was a nice shady, grassy area to sit in. Again, this was to Roo’s frustration, as he could see all the fun things he’d rather be doing, instead of eating lunch. 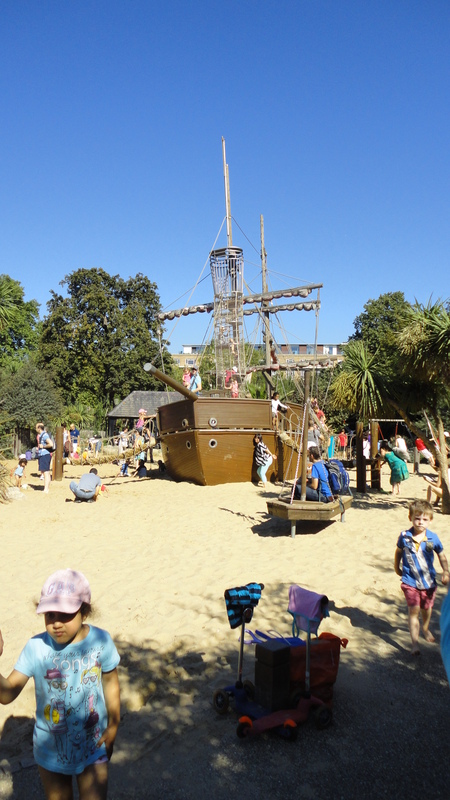 The pirate ship was almost entirely unshady, except for a bit at the back (and we did choose an insanely hot day to try it out on) but there was quite a lot of shade in other parts. When it got too crazily hot, I visited the park cafe (which serves both inside and outside the playground gates) for ice-cream. They also did classy-looking baguettes, which I doubt Roo would eat, and both kids’ and adults’ pizzas. Adults were around £7.00. Naturally, we had brought our own picnic, consisting of stuff I found in the fridge. No wonder Roo wasn’t too keen. We ate our ice-creams in the under-3s play area, despite Roo not being under 3. I thought no-one would notice, Nathan pointed out he was wearing an “I am 3” t-shirt. I pointed out that he wasn’t, he was wearing a wetsuit. Game, set and match to me. The under-3s area wasn’t overly exciting, and seemed to be mainly little huts a la Victoria Park. Plus a seesaw and a wooden car with steering wheel. If you were thinking the wetsuit meant that there was water play, you’d be half right. There was a wet area (above) but the only water came from some fountain tap things, which were kinda self-draining. Accounts differed when I asked friends whether there was water play there, but the general consensus was yes there was. General consensus, you’re wrong. There’s a puddle or two. On such a hot day, I would have gladly welcomed a sprinkler or two. Apart from that, it was a grand day out. Roo was exhausted and asking to go home by 13:30, so we did, and there was a queue of 20 or so when we left. Us leaving meant 4 more could go in (yes. they counted Eva), so we felt good about that. 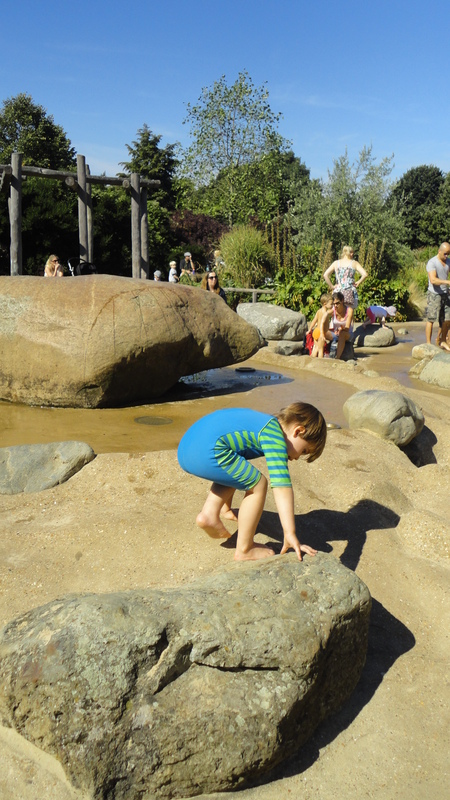 VERDICT: Yes, it probably is London’s Best Playground. Still, could do with more water play. This entry was posted in Token attempts at fresh air (parks) and tagged cafes, ice-cream, parks, playground, sandpits, slides, swings, water play, West London. Bookmark the permalink. Thank you for the tips! Love the website. We are visiting london in a few weeks time with our 2 year old (Freddie) and we were thinking of visiting the memorial park so this has been extremely useful. Best regards, Liz.